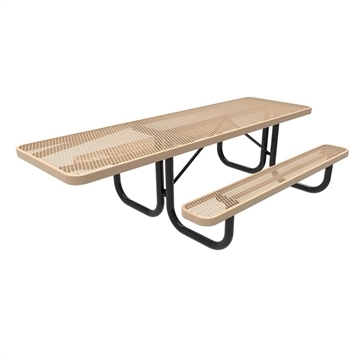 ADA Wheelchair Accessible Y-Base Picnic Table Perforated Steel, 8 foot Rectangular, Surface Mount / Portable, 265 lbs. 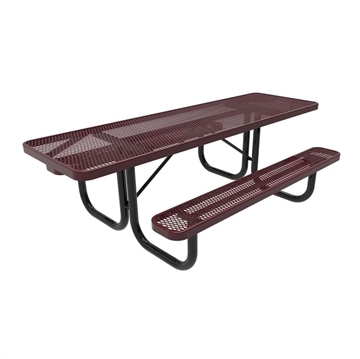 ADA Wheelchair Accessible Y-Base Picnic Table Perforated Steel, 10 foot Rectangular, Surface Mount / Portable, 295 lbs. ADA wheelchair accessible picnic tables are a necessity in public picnic areas nationwide. Picnic Furniture supplies a wide selection of sizes and styles to make picnic areas comfortable and wheelchair accessible for all to enjoy. We offer ADA approved picnic tables made from durable materials such as concrete, plastic coated, wood, aluminum, or recycled plastic. Add commercial grade umbrellas with a UBrace to provide the perfect outdoor dining area. Our wheelchair accessible picnic tables are proudly built in the USA with a 1 to 5-year warranty provided. The Americans Disability Act requires a picnic table to have a 24" overhang for toe clearance, with a width of 30" and height of 29" to be ADA compliant. Check your state guidelines for ADA requirements as they can vary from state to state. For example, in Florida, it states “The tops of tables and counters shall be 26 inches (660 mm) minimum and 30 inches (760 mm) maximum above the finish floor or ground." If you aren't sure what you need to meet ADA requirements, call our expert staff today for friendly assistance.